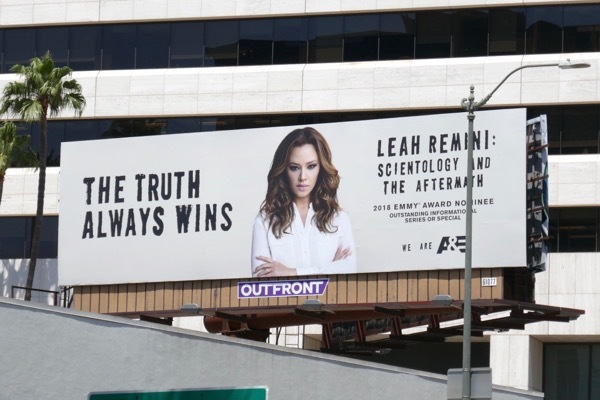 When Leah Remini left the Church of Scientology after thirty years in July 2013 she didn't go quietly, and rather than fading from public life she exposed the celebrity cult and their practices. 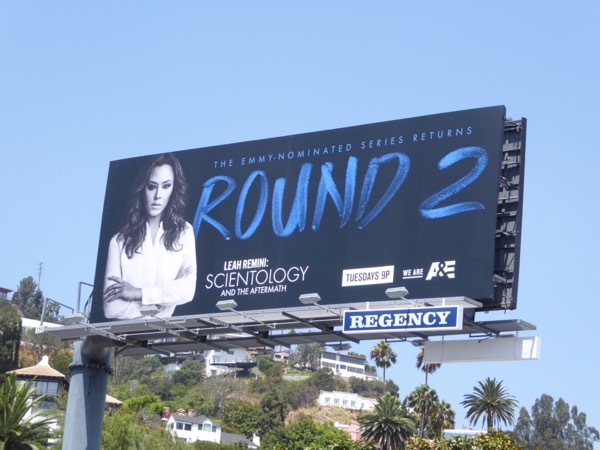 Following years of giving millions of dollars to the church founded by L. Ron Hubbard and seeing friends and family torn apart she headlined the A&E docu-series, Scientology and the Aftermath, in which other former followers came forward to share their stories of bullying, abuse and control at the hands of the church. 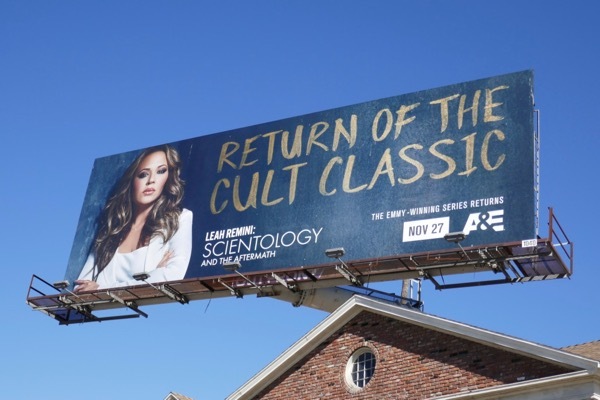 Now the Emmy-nominated documentary series is back and Leah Remini is ready to battle it out once again with famous celebrity Scientologists like Tom Cruise, John Travolta, Kirstie Alley, Elisabeth Moss, Laura Prepon and more. 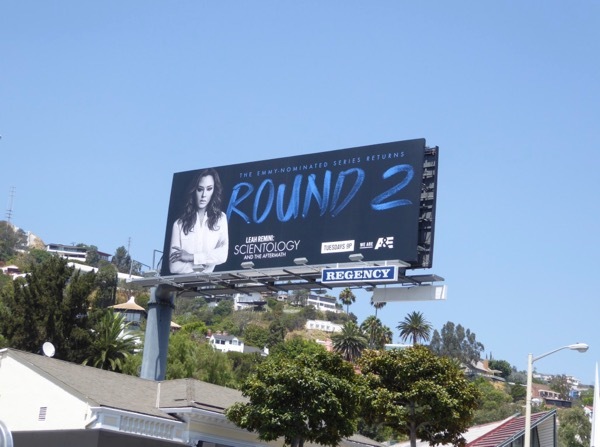 These 'Round 2' billboards were snapped along Sunset Boulevard in West Hollywood on August 14, 2017, plus fans of the show can also check out these season one and Emmy consideration billboards. 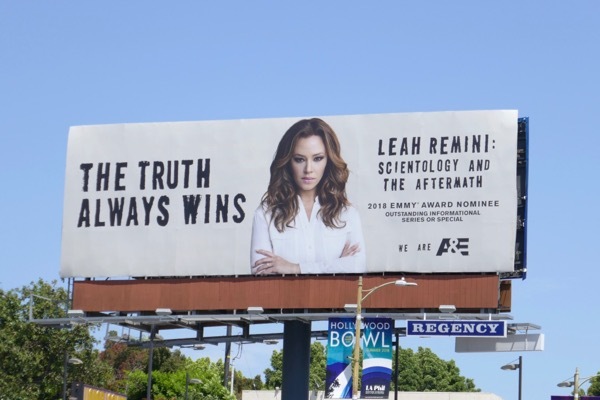 If the series wins an Emmy it'll certainly be a blow to the celebrity church, but even if it doesn't we think Leah Remini is scrappy enough to keep fighting the good fight and land a few more damaging blows. 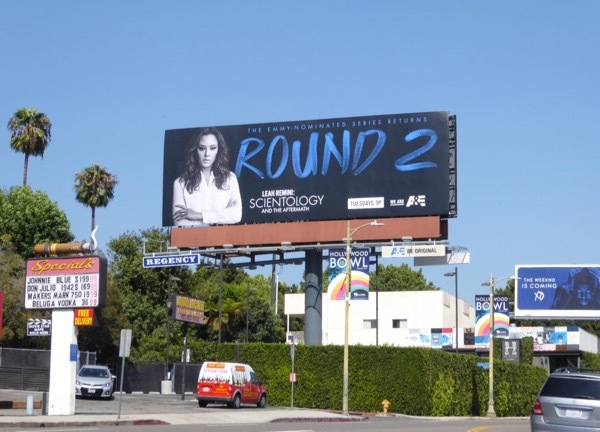 UPDATED: Here's also an Emmy consideration billboard for the sophomore season spied along the Sunset Strip on June 7, 2018. And it's true, 'The truth always wins'. 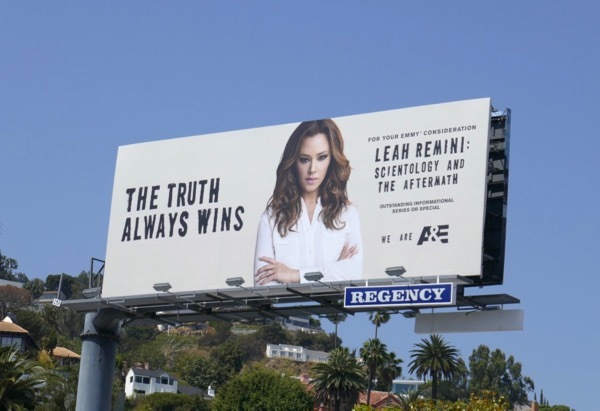 UPDATED: Congratulations to Leah Remini and her docu-series for nabbing another Emmy nomination for its sophomore season. 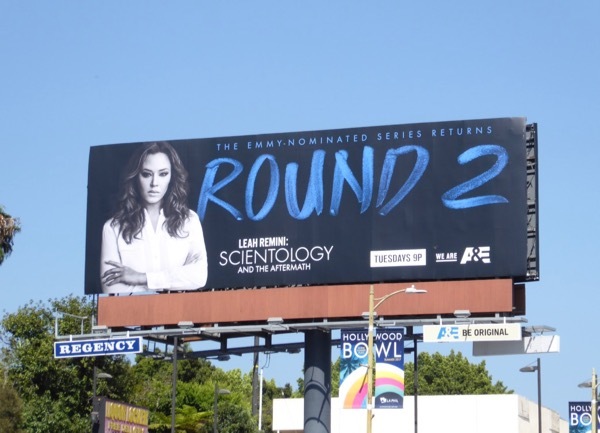 This billboard to help garner votes for the nominated show was snapped along the busy Santa Monica Boulevard by the 405 freeway on July 31, 2018. Plus here's more Emmy nominee support spied along Sunset Boulevard on August 1, 2018. 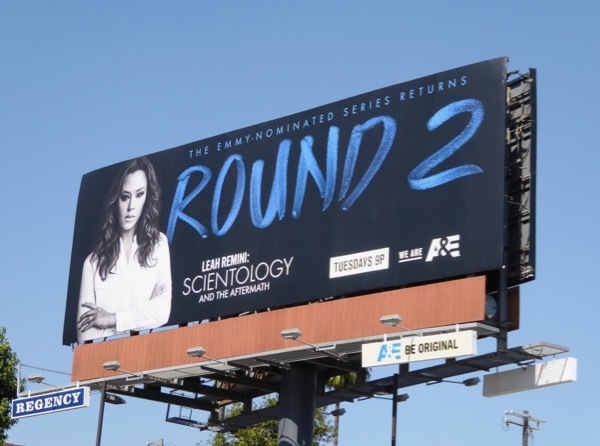 UPDATED: Watch out Scientologists, Leah Remini is back for round three of her exposé of the Hollywood pseudo religion. 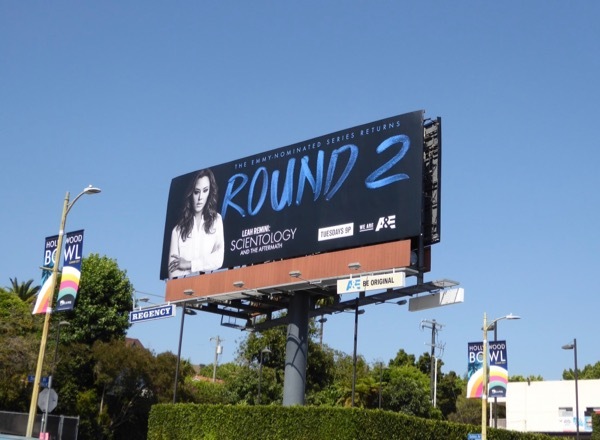 This season three billboard for the docu-series was snapped at the intersection of San Vicente and Wilshire Boulevards on October 20, 2018.